NGC 7635, also known as the Bubble Nebula (at the bottom of the picture), is a H II region emission nebula in the constellation Cassiopeia. The "bubble" is created by the stellar wind from a massive hot, 8.7 magnitude young central star, SAO 20575. The nebula is near a giant molecular cloud which contains the expansion of the bubble nebula while itself being excited by the hot central star, causing it to glow. 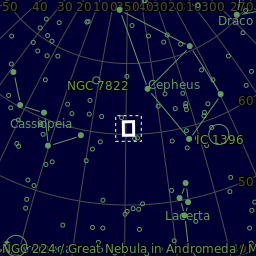 NGC 7538, (at the top left of the picture) is located about 9,100 light-years from Earth. It is home to the biggest yet discovered protostar which is about 300 times the size of the Solar System.